I swear the logwood trees are forcing me to write about them this year. Staring me down and screaming at me every day on my way to work. January to February is always their time to shine, but this year they seem to be outdoing themselves. They are absolutely covered in the delicate yellow blossoms that transform their otherwise unremarkable countenance into something quite frothy and whimsical. The bees must be giddy with happiness! Surely the honey will be overflowing this year! 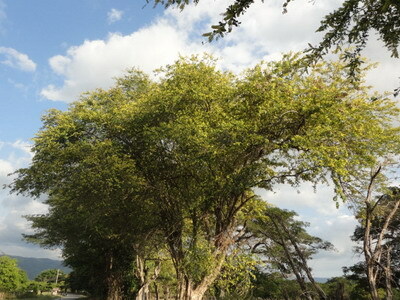 Driving around in St. Elizabeth, you're sure to pass these trees in abundance, close to the road. We cut logwood to use as fence-posts, and fully grown trees will quite often find themselves as important parts of the fencelines between pastures, properties and along the roads. They are so many of them, you'd think the tree was native to Jamaica. But it's not. 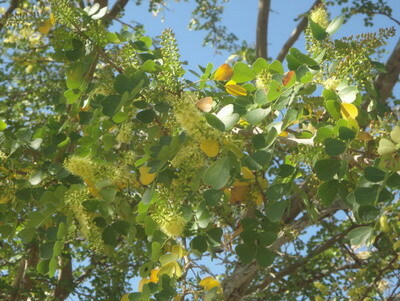 The tree is native to southern Mexico and northern Central America. Before the English got a foothold in the Caribbean, English privateers resorted to piracy of Spanish ships in order to procure logwood. After acquiring Jamaica in 1655, the English continued to raid Spanish territory by cutting trees in the Bay of Campeche, Mexico. So in addition to having to brave swampy, mosquito-ridden and crocodile-infested conditions to saw the trees, the English also had to watch their backs for attacking Spaniards. Must have been some tree to warrant all that trouble! Why were the English persistent in raiding the Spanish for wood? Well, in the days of natural things, before man discovered how to make everything from chemicals, the tree had become known as a source of dye. It had been known by the Spanish from the 1500s when they got to Campeche, and by the Mayans in the area from long before that. Its sale was outlawed in England in the 1500s, supposedly because the colours it produced did not last. In reality, the ban was probably due to the fact that logwood was competing with dyewoods grown in England. When it was discovered that the use of certain additives (mordants) would make the colours more permanent, the ban was lifted and logwood became a highly sought after commodity. Profitable enough that the English would risk their health and their lives to get it. Henry Barham was a versatile Englishman who came to Jamaica in the late 17th century. He owned plantations in St. Elizabeth and Westmoreland, he became surgeon-major of the military forces in Jamaica, and he was also a natural historian, studying and documenting Jamaica's flora. He knew of the dangers faced by the English in Campeche in their quest for this bloodwood, as logwood was also called. Barham sent to Campeche for seeds , and in 1715 had them planted in St. Elizabeth. Writing in his work Hortus Americanus Barham says the plants flourished, even on the worst lands, and that in a short time there were "seed-bearing trees enough to stock the whole island". In a few decades the logs would become a major export from Jamaica's shores, and in St. Elizabeth the plantations thrived. Logwood was at the core of the businesses that made my hometown, Black River, a bustling little port town in the mid 19th to early 20th century. The trees were cut, chipped (stripped of the bark) and sent as logs from estates like YS, down the Black River to the port. The logs would also arrive by cart from estates to the east and west of the town. From Black River the logs would be sent to Europe, where they were used to make dyes of various colours, the most popular being black, blue and blue-black. 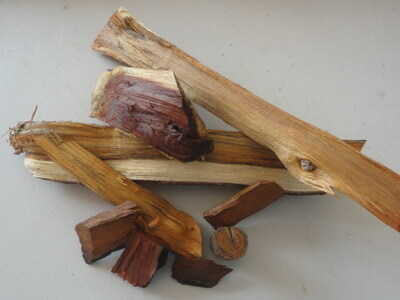 In the dye world, logwood dye is known as "Natural Black No.1". Depending on the mordant, it can produce blues, purples and black on wool, black on cotton, and black and violet on silk. 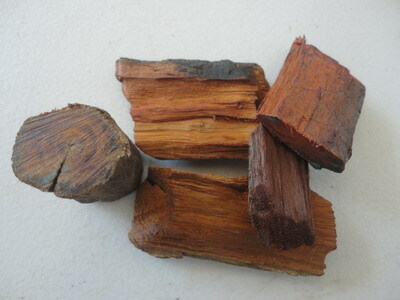 The name bloodwood is attributed to the red colour of its heart, and perhaps to the deep red colour obtained when the chips are wet. 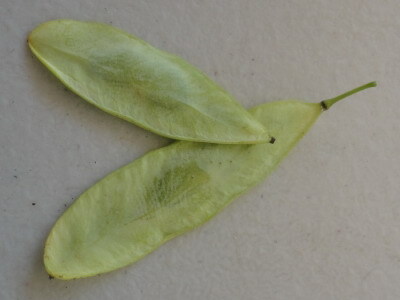 The tree's biological name is Haematoxylum campechianum. "Haematoxylum" actually means bloodwood. Until I started writing this page, I'm ashamed to say that I had no idea that the tree is a legume. My excuse is that the small flat pods look very much like leaves. Until I looked at a branch closely, I had no idea! On the urging of a friend who assured me "it won't kill you", I actually tasted what was in the pods. That was a few days ago, and I'm still here. (Growing up in the country we'd taste nearly any berry or fruit that was in our path on the way to school, unless we knew for sure it would kill us.) About the taste, I can honestly say it would have been fine if I was 8 years old! 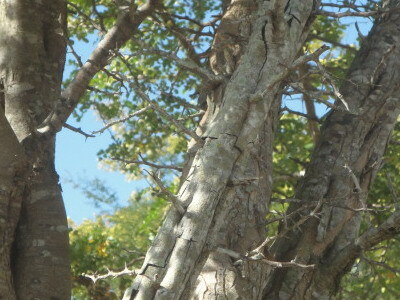 The tree is very prickly (or, as we say, full of macca) with a greyish bark. 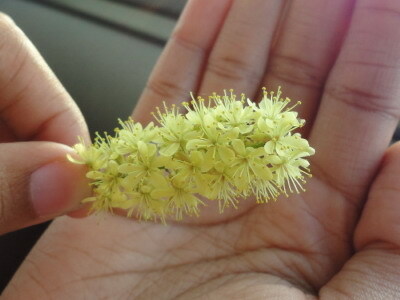 The flowers have a light, pleasant fragrance that matches their appearance. The honey produced from the blossoms is known for its high quality and light, golden colour. I tried making logwood dye by boiling some chips on the stove. The colour was a warm crimson at the start, changing to deep purple as the temperature got higher. But without a mordant to fix the dye, the colour turned brown not long after cooling. And so did the purple handkerchief I had so happily hung out to dry! I'll be sure to update you when I get around to trying it again with the right backup stuff.